Internship Program – Key Financial, Inc.
Click on a name below to watch a 2-minute video about each of our interns. Our summer internship program has been designed to introduce you to our work and the nature of our firm. The primary goal of our intern program is to give you a realistic view of our practice while also providing a range of activities to introduce you to the firm’s leaders, the nature of the business, as well as the industry as a whole. We select our summer interns carefully, with the expectation that each will succeed and be able to implement what we have taught them in their careers upon graduation from college. 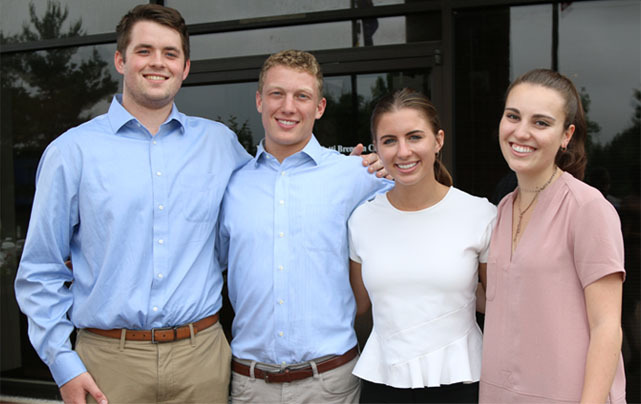 We strive to provide regular feedback to our summer interns to help expand their knowledge of the financial industry as well as their skillset within the parameters of our program. Members of the Key Financial team will serve as mentors. These mentors will educate interns on a variety of elements of financial planning, answer questions, and provide many ongoing assignments and projects designed to sharpen your skillset and knowledge base of our industry. Summer interns will receive formal evaluations at the end of the 11 week program and will also leave with a completed resume. Interns are always encouraged to ask questions throughout the program with a solid foundation in the understanding of what true financial planning is, and a desire to pursue a career in the financial services industry. Upon occasion, qualified interns may be considered for employment upon graduation. There are four intern positions available every summer. The eleven week program begins mid-May and concludes at the end of July. Many interns ask if they can come back to work over Christmas or Spring break and we are happy to have them! In addition to interviewing for an intern position through the career center of local Universities, you may also send your resume, a cover letter and transcript to Bernadette Hunter, Director of Communications, Key Financial Inc., 1045 Andrew Drive, Suite A, West Chester, PA 19380 or by email to bernadette@keyfinancialinc.com.